Vincent Willem van Gogh supo transformar colores en poesía. Su obra, invalorada en vida, es apreciada por su excepcional carga sensitiva, un valor que no registra puntos en común con ningún trabajo de otro artista de cualquier época de la historia. 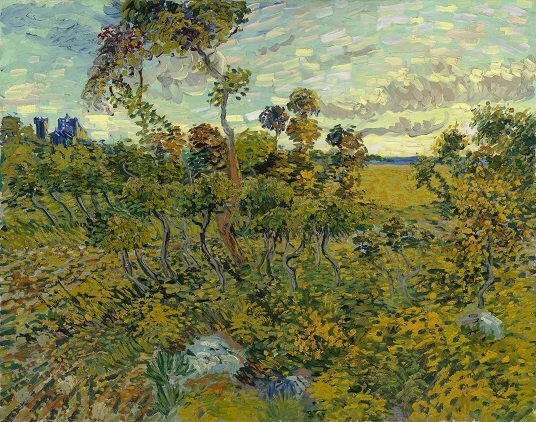 Una investigación realizada por el Museo van Gogh de Holanda certifica el hallazgo reciente de una obra desconocida. Se trata del cuadro “Puesta del sol en Montmajour”. Fue realizada por Van Gogh en 1988 en Montmajour, un pueblo cercano a Arles dedicado a la vitivinicultura que Vincent visito para pintar las ruinas de una abadía abandonada. Vincent Willem van Gogh was able to transform colors in poetry. His work, invalorada in life, is appreciated for its exceptional load sensitive, a value that does not register any points in common with the work of another artist of any time in history. An investigation by the Van Gogh Museum in the Netherlands certifies the discovery of a previously unknown work. This is the painting “Sunset at Montmajour”. The work was done in 1988 in Montmajour, a village near Arles dedicated to viticulture Vincent visited to paint the ruins of an abandoned abbey. The relatively large painting (93.3 x 73.3 cm) has been technically researched by our restorer Oda van Maanen, in cooperation with the Cultural Heritage Agency of the Netherlands (Rijkdienst voor het Cultureel Erfgoed) (RCE), with X-ray photos and computer analyses of the type of canvas used. The pigments used have also been identified. Microscopic research has been carried out into the various layers of paint. Everything supports the conclusion: this work is by Van Gogh.